NYC residents live an aesthetic and elegant lifestyle. Naturally, they're attracted to clean spaces and polished marble floors. Some businesses or apartment tenants don't have time to polish their marble floors and, even if they did, they wouldn't have the necessary materials and equipment for the treatment. You need the professional touch from a reliable stone care company for your marble polishing in NYC. Statewide Stone Care has the knowledge and experience to handle your marble polishing service. We have provided high quality marble polishing to many satisfied clients for over 10 years. 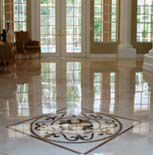 We use state-of-the-art equipment to perform the proper polishing treatment your marble floors needs. Marble Stains - Since marble is made using calcium bicarbonate, it requires specific cleaning agents and equipment to remove the toughest of stains. Many marble stains can be easily removed, but only a professional stone care company, like Statewide Stone Care, can handle the hardest stains embedded in the marble surface. Mark Removal - Marble is susceptible to getting markings etched into its surface from acidic substances or a soft stone. Our stone care experts can inspect the marks left behind from whatever acidic liquid substance was spilled and get right to work on giving your marble floor the polishing it requires. The final result being a clean floor surface looking fresh and new. Marble floors need to be maintained carefully and with the professional assistance from our experts at Statewide Stone Care, your marble floors will be ready to take on another day. Don't leave stains and marks on your marble floors! To learn more about our marble polishing in NYC or to inquire about our other services at Statewide Stone Care, contact us at 1-800-574-5595. Statewide Stone Care - Your trusted experts for Marble Polishing in NYC.